Now that we have the requisite metadata it’s time to use it to create our Biml files. In order to handle the requirements of different feeds, i.e. different target dimension and fact tables, some files will require data to be unpivoted and some will contain multiple demographic attributes so we will need to write quite a bit of code. It is common practice in a Biml Script project to have a C# include file with all your custom code in it. This is a bad idea because it ignores the issues in a real production system such as being able to independently test the code and the management of secrets such as connection strings, passwords and so on. By creating a separate C# project, these limitations can be overcome. We can also include a test project so that every piece of functionality can be tested and debugged independently. We can use user secrets files to for local development to hold the database connection strings and passwords so that developers can’t accidentally check them into source control. An in depth explanation of tiers is beyond the scope of this blog, but essentially they control the order in which the Biml compiler compiles the files. This is important so that resources required by lower tier files have already been compiled and are available to their parents, or children depending on how you want to look at it. I have settled on a two tier approach, Tier zero is the main block and tier one is used to abstract out the flat file formatters and script tasks. I also have a common variables file for, well, common variables. The pattern I have used is to initially load the flat file data to staging tables and then process the staging data into the data warehouse, applying validation and matching rules as agreed with the client. A strong auditing/reporting regime is important here in order to be able to satisfy client queries. Finally the data ends up in our single customer view. Depending on your business and clients you might also want to store the supplied data files somewhere else, exactly as they were received, either in SQL tables, SSIS Raw files or just store the original files in the file system. You will definitely want to archive the supplied data somehow in case of client queries. As an aside, if you do retain original files, I recommend you encrypt them with a strong encryption like GPG. This provides two benefits: One it protects you in case of a data breach, and two, it has the benefit of compressing the data, so reducing storage costs. In tier one I have two files: Tier1ScriptProjects.biml contains script projects, while Tier1FileFormats.biml is responsible for creating the flat file connection, database connection and Flat File Format based in our file header and column metadata. Tier 0 is responsible for generating a separate package for each file in the MappingFile metadata table. This is where the hard work is done as each flat file may have a different combinations of dimensions and facts that will be loaded and all these have to be determined at compile time. In order to do the initial staging, we need to dynamically generate the flat file connections and formatters using the metadata discussed in the previous post. 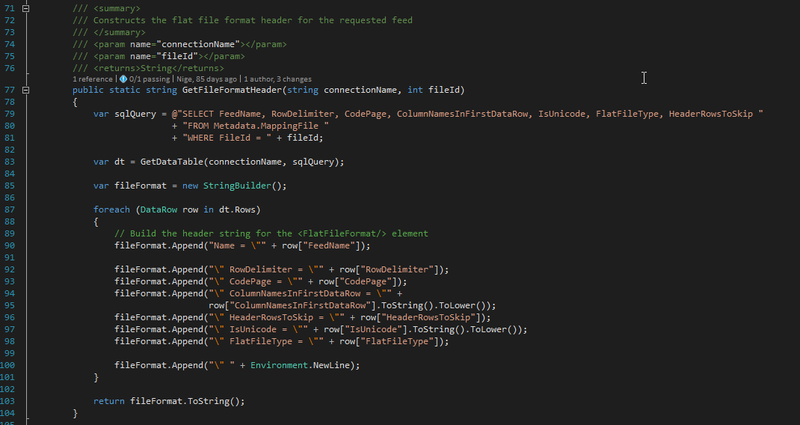 We use convention, naming the flat file connection with the same name as its formatter, to ensure the connector and formatter are correctly wired up in the generated Biml. This pattern of using a query to populate a data table object and then loop through it to produce the BimlScript is used all the way through. In this case it uses the file metadata to construct the header descriptor on the <FlatFileFormat> element. Then we call GetFileFormatColumns() to generate the <Columns> elements. The resulting BimlScript for a single file formatter comes back something like this.